Brace yourselves for a rave review: you’ve probably guessed that it will be because it’s got “Liquid Gold” in the title, and we all know how I feel about that! If you don’t know my feelings on Liquid Gold then you can read about them here, here and here, as well as about a hundred other places on this site. Liquid Gold is a glycolic-based treatment that you swipe over your skin before bed, about two or three times a week, and it works by dissolving the bonds that hold the dead skin cells together on the surface of your skin so that they can be sloughed away, leaving skin clearer and brighter. You might find that with this regular, non-abrasive exfoliation that your minor breakout problems cease to exist (I find that my pores get blocked far less when I use it) and skin just looks more refined and “toned”. It’s kind of like an overnight facial, though a very sparse and no-frills one! It’s simply a one-step process – a liquid that isn’t followed by any cream or other treatment. But what if you want it to be more of a tactile experience? What if you enjoy applying a cream, or find that you really need a moisturiser every night? I always wondered about this, because although I don’t have dry skin (I’m combination) I do like the ingrained ritual of applying a night cream. Although I only apply the Liquid Gold once every three nights or so, I still miss applying a cream on those nights. I mean, not in an “I’m DYING, let me apply CREAM, I have to apply CREAM!’ kind of way, but I do like sitting beside my bed and going through my bedtime ablutions. So I have to say that I was thrilled when, before Christmas, I was introduced to Alpha-H’s latest launch: the Liquid Gold Rejuvenating Cream. I initially dismissed it as “not for me” based on the press release blurb – it seemed to be aimed at drier, more mature skin. But Michelle from Alpha-H soon put me right – it would be perfect for my skin, she said, because I had been moaning that I wanted the effects of glycolic (brightening, exfoliating) but in a product that would help treat my spot scars, or at least stop them from getting any darker. I wanted an all-rounder, something that would do everything in one big hit. When she ran through the ingredients and what each one was designed to do, I realised that the Rejuvenating Cream was a very comprehensive, all-round problem-sorter. So here goes – my attempt at explaining what it does. Glycolic acid does the same as it always does – exfoliates and brightens – though the pH of the cream is higher, so it might not have such an “unadulterated” effect as the pure stuff! Add to this Vitamin C, which helps to reduce pigmentation and is also antioxidant, so helping the skin to protect itself from further environmental damage. More antioxidants from the Argan stem-cells, and also peptides (Lipo-peptide Matrixyl-6) to help the skin produce Hyaluronic Acid. Lots of things in that pump-action pot that are designed to make the skin jump through hoops – rejuvenate, turn over new skin cells, protect itself, moisturise itself. That’s what skin needs to do, I think – help itself. It’s pointless having a layer of lard sat on top, doing nothing very much in particular apart from whistling into the wind. It needs to get with the programme, do a few star jumps, get a new lease of life. This cream could easily be misconstrued, I think – any hint of the words “mature” and “dry” and I instantly think that something will be incredibly rich and heavy. This isn’t – it’s light, absorbs easily with no residue and feels fresh and zingy. It stings a little if you haven’t used a chemical exfoliant before, or have had a little break from them, but nothing too hideous. It’s best used at night, I think, rather than during the day, as I like not to have to follow it with anything else, and in the day you’d have to add an SPF. Important, actually, to note that it doesn’t contain SPF and that you MUST, MUST use an SPF if you’re clarting around with chemical exfoliants and the such. It would probably do more harm than good to regularly exfoliate in this way and leave the skin unprotected, though really we should all be wearing some kind of UVA/UVB protection on a daily basis anyway. Personally, I use the Rejuvenating Cream last thing at night, after the Intensive Night Repair Serum or just on its own. If you want to change up from the Liquid Gold liquid and want something that ticks a few more boxes (antioxidant, hydrating) then this is worth your attention. Well worth it. 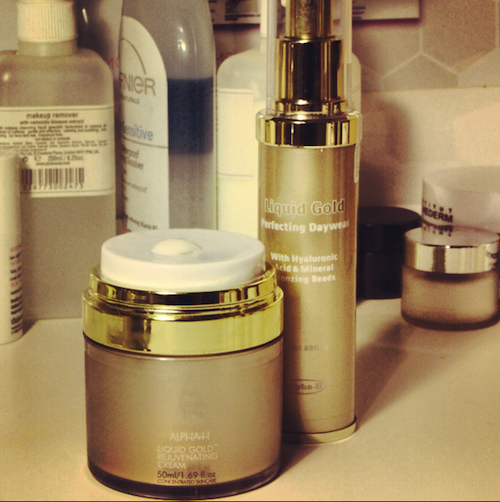 In summary, then, because I know that you’ll want to know which one to go for: Liquid Gold vs Rejuvenating Cream. Well, I’d say that if you want a targeted exfoliating action to really brighten skin and help to keep it clear, then look to the Liquid Gold. You can easily pop this into your routine (and I do) as a long-term addition or for the occasional pep-up. It’s just an easy liquid that lasts for ages and really works miracles overnight. If you are in your thirties or older and you want something that hydrates the skin to plump out those little fine lines, as well as making the skin look less tired, as well as helping out with those pesky dark spots, then go for the cream. Of course you can use both – the cream could be used in-between the liquid nights. Just start carefully, especially if you haven’t used any glycolic products before, and bloody well wear an SPF in the daytime! I can’t find anything that I don’t like about the cream – the pot is well-designed and keeps everything fresh (though it does tend to burst upwards like a volcano if you’re too enthusiastic with the press-down top!) it’s a great, silky texture and it works. It does brighten, it does pep-up tired faces, it does get rid of those dull, useless dead skin cells. You don’t need loads in every application – it spreads very easily, especially over the night repair serum – and a 50ml pot costs £49.